I won’t bore you too much with the nitty-gritty of how Wargame works, since I already went into it in excruciating detail in my reviews of European Escalation and Airland Battle. The conceit of the series is that various Cold War militaries are fighting it out over battlefields measuring several dozen square kilometres, and that the way the game represents this combat strikes a good compromise between grognardy realism and actually being able to finish a game inside of half an hour without your squishy human brain imploding under the sheer weight of all the numbers. 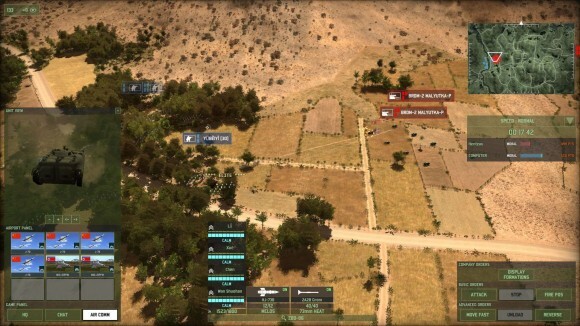 Units are modelled on the scale of individual tanks and squads of infantry, and the whole thing is very slow and very micro-light; the outcome of a firefight will rely far more on your units’ positioning and line of sight when you started it than it will your ability to issue orders to those units in the heat of the moment. Because the battlefields are so large it can take several minutes to redeploy forces to face a new threat, and since it’s so hard to react quickly (save with aircraft) you spend nearly all of your time in Wargame zoomed out and considering the big picture. Where are you going to apply pressure next? 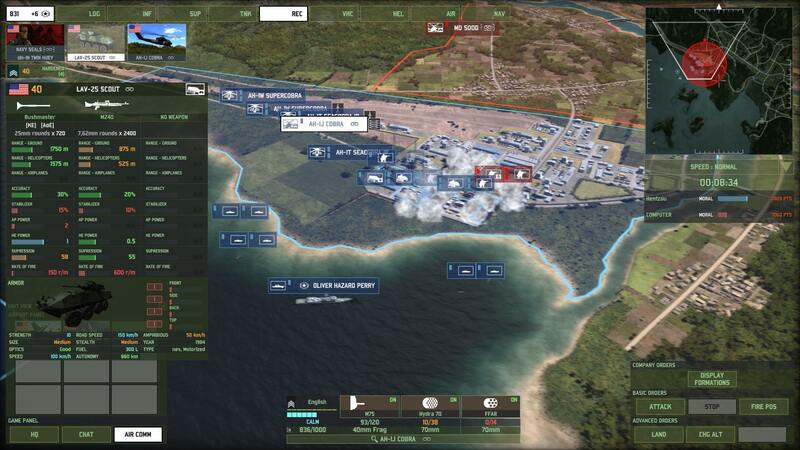 Can those infantry squads holed up in the town hold out against a potential attack, or will it be a good idea to station some reserves nearby to minimise your reaction time? What’s the best place to put your recon units so that you can see the enemy coming ahead of time? These are the questions that occupy your attention in Wargame, and there’s nothing else quite like it on the market. Airland Battle’s headline addition to the gameplay first demoed in European Escalation (aside from a drastic overhaul of unit counters that made them far easier to decipher) were a hundred-odd variants of jet aircraft, and their ability to arrive at any location in seconds on a battlefield where everything normally moves so slowly completely changed the flow of a battle. Airland Battle and European Escalation are consequently very different games. 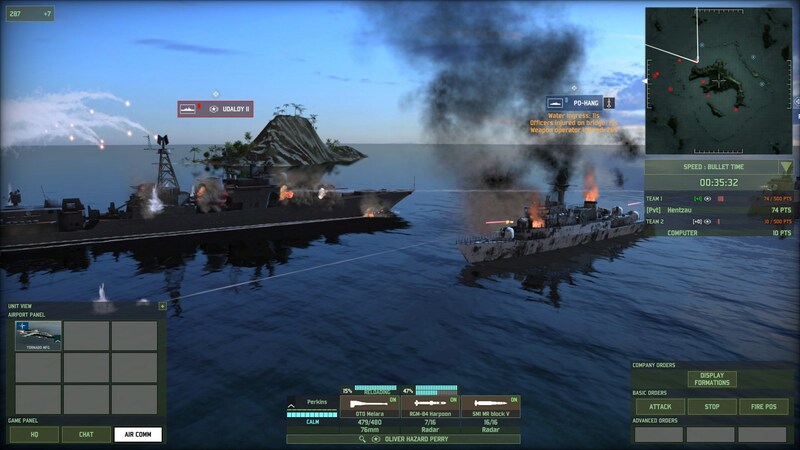 Red Dragon’s headline addition to the gameplay of Airland Battle, on the other hand, is boats. Boats which have been just as lovingly modelled as the rest of the units in the game, and which are preposterously powerful when they actually get to shoot at things, but which are, at the end of the day, boats. Which are by their nature restricted to water, an element which has hitherto not featured on Wargame battlefields beyond the odd river or lake. They don’t have anywhere near the impact that planes did. They physically can’t, because unless you’re playing a naval battle (an absurd scenario that fits Wargame about as well as the naval battles fit vanilla Shogun 2) they’re restricted to no more than a third of the map at any one time. As a result Red Dragon battles play out much the same as the ones in Airland Battle did, and therein lies the rub: while it certainly makes more of an attempt to change things up from the previous incarnation than your average edition of Football Manager, there’s no getting around the fact that if you already own Airland Battle Red Dragon can’t show you much that is genuinely new. Yes, there’s new nations involved in the game now – both Koreas, China and Japan – but there’s already a thousand plus units present and past a point increasing the number of units is just adding digits on to a meaningless number – especially when most of the new units are simply national variants of existing Warsaw Pact/NATO ones. Does it matter that there’s twenty different types of ATGM team in the game now when you’re going to use them the same way regardless of what they are? I don’t think it does, and so while the new nations serve to frame Wargame’s single-player campaigns very well they don’t materially add to the gameplay. In fact I’d argue that they outright detract from it, since even as a veteran of the previous titles I’m having extreme difficulty figuring out the difference between a BMPT-60 and a VTT-223 in the heat of the moment. So instead of changing things up the way Airland Battle did Red Dragon instead just loads more on top of the existing structure, and it’s starting to show visible signs of strain. So much development time has gone into the boats and the new units I’m starting to think Eugen care far more about smashing their virtual toys into one another than they do iterating on an excellent concept. And that’s kind of a shame, because Red Dragon does make one extremely significant improvement that might be worth picking it up for, if you’ve previously avoided the series: the stillborn dynamic single-player campaign system of Airland Battle has been drastically reworked into something that definitely has the potential to revolutionise Wargame yet again. I’m really impressed with the changes that have been made to it, and I feel if it had received a little more attention it could have been something very special. These dynamic campaigns consist of a turn-based strategic layer, where you move counters representing your formations around a map depicting whatever the flashpoint de la jour is – Korea, the Russia/China border etc. – and when you encounter the enemy the action switches to the real-time battles the series is known for. This is all very Total War, and the previous attempt at implementing this system in Airland Battle fell rather flat, but Red Dragon has made some changes that I think lend the campaigns some real weight. First, you’re no longer dealing exclusively with regiment- and division- sized formations. Those were far too unwieldy in Airland Battle, not to mention ridiculously lopsided – I remember the Royal Marine division with 80 squads of Marines and no armour or support vehicles worth a damn – and Red Dragon has ditched them in favour of a more granular structure comprised of smaller collections of troops. Regiments are still in the game and function as the core of your armies, but they’re now supported by battalions and companies of more specialised troops allowing you to mix and match as needed to create an effective fighting force without having to rely on the blunt sledgehammer of a division. If you need your infantry regiment to have a little extra punch you send in a tank battalion with it. An anti-tank and a recon company working together with a squadron of fighter-bombers can blunt any armoured thrust the AI makes. This organisation of forces is not only more flexible but it also gives your troops a sense of personality and history; the South Korean infantry regiment holding on to Uichang in my Korean War II campaign was nearly annihilated on the first day, but they were propped up during the remaining seven by a company of TOW-equipped jeeps and a flight of obsolete F-86 Sabres that made attack run after attack run on the advancing columns of T-55s. It is possible to refit damaged formations to replace losses, but this takes a considerable amount of time and all of the campaign scenarios are time-limited; in practice anything that gets destroyed usually stays destroyed, meaning that campaign battles are no longer a matter of simply destroying X point value of enemy units. Now you have to do that while also preserving your forces so that the formation is still combat-effective throughout the campaign, and a victory where you gut your best regiments to seize a sector is no victory at all since it makes the prospect of future victories all but impossible. Therefore the single-player campaign is all about fighting one battle while making sure the same formation can fight another one two or three turns down the line, and this emphasis on long-term thinking is a real game-changer in the way a typical battle plays out. Even with reinforcements the number of strategic units available to you is extremely limited, and so that company of crappy obsolete tanks is no longer cannon fodder used to waste enemy an ATGM squad’s supply of missiles. Instead you have to figure out how to make the most of its strengths and get it through the battle relatively intact. 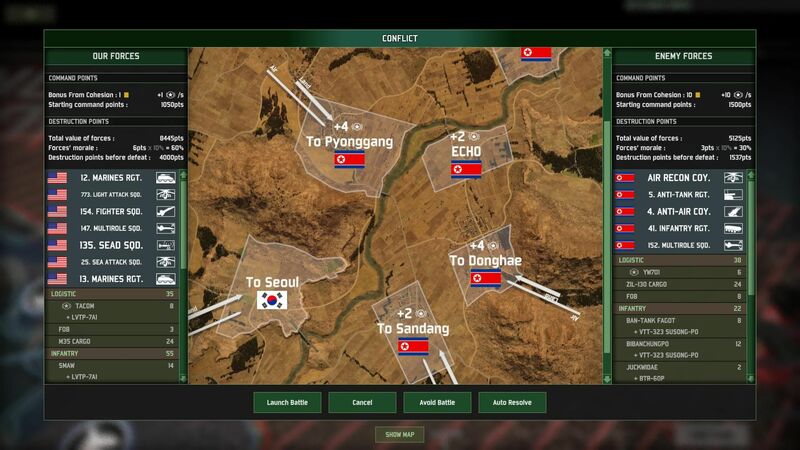 It’s rare that you’ll have the manpower to absorb serious losses; only in the first campaign does Red Dragon cut you a break and hand you an entire carrier task force worth of Marines to slice across the North Korean bridgehead, and even then this overwhelming force is isolated from the hard-pressed South Korean defenders who are weathering attacks from North Korean armies twice their size day after day after day. You’re constantly aware that losing too many tanks, too many ATVs or too many aircraft in the real-time battles will have a severe impact on your ability to continue the fight on the strategic map, even if you win. Happily this attrition is just as true for the AI as it is for you, and if you’re smart, leverage all the force multipliers available to you and kill enough units, you can outright destroy enemy formations1. Thanks to this shake-up the campaigns have gone from an anaemic secondary priority to a meaty, thoughtful strategic challenge that’ll keep you occupied for hours. There are four of them in the game and they make very good use of the new nations and even of the naval forces available to you; I think every single one of them involves marine battalions making an amphibious landing and this is the one point in the game where the boats actually make a significant difference, covering your amphibious infantry carriers while they make their way to shore. Sadly they’re still a little rough around the edges and – criminally – have practically no sense of payoff, with the six hours of planning and scheming and countless hard-fought battles to achieve victory being acknowledged by nothing more than a one-liner from one of the generic talking heads before you get dumped back to the main menu. Where are my casualty reports and my summary of destroyed enemy formations over the entire campaign? Why do I care if I achieve a total victory over a minor one? This final piece of context is conspicuous by its absence and left me feeling cheated after completing the South Korean and Chinese campaigns. I think that if they’d included a little more narrative impact like that and also tightened up their battle AI (which is still ludicrously psychotic and very easy to bait) the campaigns would have been Red Dragon’s unique selling point, something worth buying the whole game for. Instead we have a bit of an odd scenario. If you enjoyed European Escalation then buying Airland Battle was a no-brainer since it was one of the best games released last year, but the same is not true of Red Dragon. I think the people most likely to get their money’s worth are those who really like Wargame, and those who are interested in the series but who want a decent single-player component and have been put off the previous titles by the heavy multiplayer focus. If you fall in between those camps — you enjoyed Airland Battle, but aren’t really in the mood for a game that’s just more of the same – then there’s nothing about Red Dragon that particularly screams “Buy me now!” And if you’re not interested in Wargame, period? Red Dragon is unlikely to change your mind. I don’t get Wargame. Bought Airland Battle recently and like it’s complexity and difficulty, but there’s something inherently imbalanced about it. Realistic detailed graphics do not make sense cause you mostly work with icons zoomed out. At the same time the units are so diverse. You don’t even see unit roles anywhere, you have to click it and check what weapons it has, how far can it shoot, how much shots can it fire, can it shoot helicopters/planes. I feel like I’m in party-based RPG without any classes defined. I’ve completed 2 campaigns and still checked every unit statistics before battle to try to grasp what I’m working with. It feels that there’s a very long way to being able to understand what happens in the game, and even longer one to multiplayer. 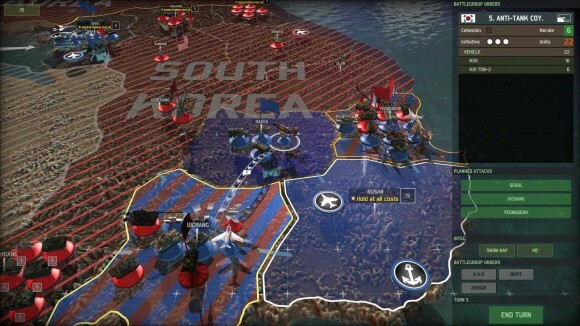 Also with all it’s realism it tells me that WW3 would be a series of battles with ~10-20 units on each side. Now that I’ve went back to read your review of Wargame EE I see that you’ve tried to warn me about all of this. I don’t understand how some games can immediately ask you to invest hundreds of hours in it to be able to get fun and understand what happens… and become popular. Same thing happens in Dota/LoL, but they’re fun and quick and fantasy but this is I don’t even. This is part of my criticism of the focus on adding new units: there are so many that you have to boil them down to twenty-odd unit types which all function more or less the same way, and so adding more of each type is pretty meaningless. That it’s historically been so multiplayer-focused is another weakness of the series, since while the matches are stonking they do rely on you learning the minutiae of the units to do well. However, against the computer you can get away with not knowing much of that stuff because the computer is particularly vulnerable to smart positioning of even awful units. It’ll happily run its armoured units straight into woods and towns full of infantry, for example, and so you can get away with a generalist approach based on the unit icons (which do explain unit role pretty well, although I’m not sure where they’re documented in Airland Battle). You don’t need to know the strengths and weaknesses of every individual type of ATGM to employ an ATGM team effectively: stick them in a wood with a decent line of sight towards the enemy’s expected approach, and you can basically forget about them for the rest of the game since they’ll do their job without any intervention from you. That being said, having just attempted to make a deck in Red Dragon for the first time in a year the deck construction is absurdly overwhelming because there’s so many units and you can go mad trying to figure out which one you should take and why. My advice is not to worry about that too much; just take stuff into skirmish mode and see how it works out for you. I’ve tried to think again about this problem. In Total War you have many different units too, but there’s not so much difference between units of similar role and at least you see unit’s primary role (light infantry, artillery etc). Here with your examples of how 1 letter change may mean that the unit has AA gun it’s much harder. And icons do not help, cause this “recon” or “transport” icon may mean that the vehicle has no weapons at all or that he’ll shoot my infantry from afar with machineguns. Couldn’t they use some keywords? Or quick table rating like total war does? 3 stars vs armor, 1 star recon, 2 stars vs infantry?.. I’ve recently been trying to get into Starcraft II and it is like punishment from God. You have my sympathies. Every so often I think about trying Starcraft II multiplayer again, and then I remember how stressed just doing the five calibration games made me. It’s not for the faint of heart. Today I’ve tried to play League of Legends cause Hearthstone dropped me to a 20 rank. After seeing some threats, insults and REPORT shouts I’ve remembered why I didn’t play LoL for so long. And they didn’t even insult *me*. My problem is that either anyone not fanatically devoted to Starcraft was scared off long ago or the matchmaking is hopelessly broken. I’m level 6. The lowest-ranked opponent I’ve played was 29. The highest-ranked was over 100. I jumped into Warcraft III back in college, long after the game was out, and didn’t have an experience like this. I actually was decent as the Horde and more than once surprised opponents with my (now fondly-remembered) favored strategy. Starcraft II is just a nightmare, though. I got to platinum rank in Starcraft a couple of years ago playing only mech terran. I would love to go back, but played a few games and simply can’t cope with how terrible I am now. My MMR rating also has barely decayed it seems, as I am still matched with gold league players who murder me. I’ve started playing Dota recently and am loving that game, albeit I am incredibly frustrated already with IDIOTS who feed the opposing team FOR GOD’S SAKE. I like the game except for the one thing. The advertised Ships feature is actually worsr part of the game, so 90% people in multiplayer play land-only maps.